Private & Romantic 1 Bedroom Cabin in the woods. Near Helen, Ga. TRUE ROMANCE is our most popular cabin for couples. Located about a 12 minute drive from HELEN, GA. This cabin, built with the mountain style with timber frame wood interior and porches, is a tribute to the incredible talent of several local craftsmen and artisans. The heart-shaped stained glass windows will sure bring in the charm and romance. Designed as an open studio, this cozy cabin is perfect for a quick romantic weekend or an extended honeymoon stay. The kitchen is beautifully done with handcrafted wood cabinets and granite counter tops. Sleep in front of the fire on a king size bed, handcrafted by a local North GA craftsman. 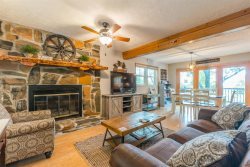 Located in our Blue Creek Development, with only a short walking distance from our walking trails & Private trout pond, this cabin makes a great vacation for anyone looking to have fun and relax. True Romance is perfect for anniversaries, honeymoons, birthdays or any special occasion. Come and enjoy it, because you deserve it! Pets: 1 dog only, under 15 lb. $50 Charge. The road to this cabin is maintained gravel. The sleeping arrangement consists of a king size bed. Washer/Dryer located 2 min away at the office. We never met any of the staff, but check in and check out was very easy and hassle free. People that we met in the neighborhood were extremely friendly and helpful. We didnt know that it was a one way street so they stopped us and instructed us of the flow of traffic very helpful. The cabin had everything we needed and met our expectations. Was exactly like the pictures. Other than a few minor issues we had a great week in north ga. Great location for getting to Helen, Cleveland, Dahlonega, and Gainesville.